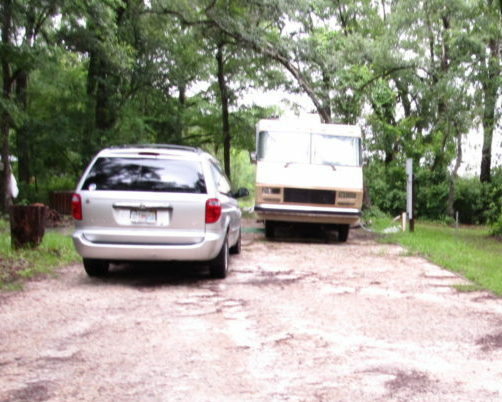 The RV and volunteer campsite needs to have its spring cleaning done on it. Living in one spot for any length of time and you will collect a variety of things in and around your RV and site. Your RV will also need to be washed up, the roof cleaned and made ready for an annual maintenance it will need and the tires checked to make sure there are no dry-rot spots. We also like to take everything out of the storage compartments, clean the boxes up and reorganize everything back into their various storage bags, boxes, etc. and throw away things we have collected but haven’t used in over a year. Inside we usually clean the roof with glass cleaner and the walls with those Lysol orange wipes. Yes, you will go through quite a lot of those but with all the dust and other particles clinging to just about every surface those wipes come in plenty handy and they smell nice too. Of course, you can use whatever scent you like. Then the arduous task of cleaning all the windows inside and out. A nice folding ladder comes in handy for the outside. It usually takes us at least a week or two to completely do the place from top-to-bottom and inside-and-out. Then we will be ready for another couple of months until the fall when we do it all over again.